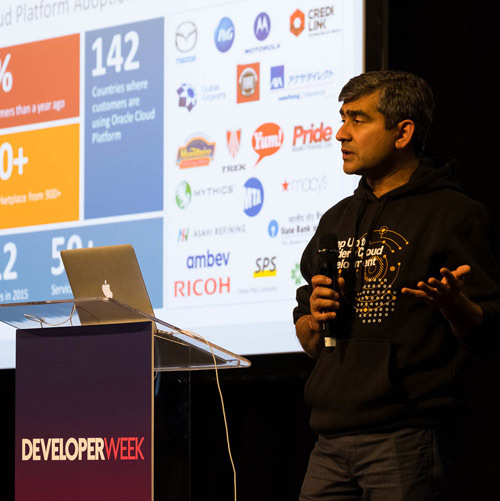 At DeveloperWeek 2017 in San Francisco yesterday, Oracle’s Amit Zavery, senior vice president of Oracle Cloud Platform, delivered a keynote address focused on the company’s cloud offerings and services. The keynote precedes the commencement of a 20-city tour by the company in support of its cloud offerings. Zavery focused heavily on the paths available to developers for building modern applications inside Oracle’s cloud. He said he hoped to show developers what the next generation of cloud applications will look like. Zavery said that developers could use the Oracle cloud to construct applications that scale to the size of WhatsApp, and suggested that such an application would be empowering to enterprises. He also discussed the importance of chatbots. Oracle will begin its 20-city tour on March 1. The event will be called Oracle Code, and will be a free mini-conference focused on using and enabling enterprises through the Oracle Cloud Platform. DeveloperWeek continues today in San Francisco on Pier 27. DevNetwork produces definitive industry conferences for Mobile Tech, Developer Tech, and Integration Tech.